The island of Roatan is the largest of the Bay Islands of Honduras, located about 40 miles from the northern shore of Honduras. Situated in the mesmerizing Caribbean Sea, Roatan enjoys gorgeous tropical climate year-round. That’s not to say there’s cloudless sunshine every single day of the year. We also have our rainy season, plus typical tropical rainstorms intermittently throughout the year. But the incredible benefit of this tropical weather is our lush, verdant jungle. Roatan isn’t an arid, flat Caribbean island. We have gorgeous green hills rolling the length of our island home, offering us endless palm trees, fruit trees, and vibrant tropical flowering trees everywhere you turn. There’s nothing better than picking fresh fruit for breakfast off the tree outside your bedroom window. The main language spoken in Roatan is English. However, if you speak Spanish, it will certainly help. The national language of Honduras is Spanish, so legal documents will always be completed in Spanish. The history of the Bay Islands has left a very British mark in Roatan. Native islanders traditionally speak English at home and the increase of tourism has continued the importance of English among an international crowd. Public schools are taught in Spanish, so keep that in mind if you’re moving here with children. Most private schools offer a bilingual education. The primary residential areas for expats moving to Roatan are West Bay, West End, and Sandy Bay in the western side of the island. Centrally located Pristine Bay is Roatan’s only golf community and is incredibly desirable. On the East End, there are many neighborhoods becoming popular with expats, especially Politilly Bight, First and Second Bights, Port Royal, and Calabash Bight. French Harbour and Coxen Hole are the primary commercial areas of the island. In both, you’ll find banks, shopping, grocery stores, municipal offices, hospitals, petrol stations, and more amenities. The primary transportation hub in Roatan is Coxen Hole, with the airport just outside the main town, plus the first cruise ship port downtown. A bus terminal is also downtown. You’ll find the ferry dock and second cruise ship port (Mahogany Bay) closer to French Harbour. If you move to Roatan permanently, you will likely want to purchase a vehicle. Some residents will also buy a scooter for short trips, primarily those living in West End and its nearby neighborhoods. Taxis are run on a colectivo system, meaning you will pick up and drop off other passengers along the same route. If you prefer a private taxi, you must request it as privado. Past French Harbour to the east, public transport is less common so you will need your own vehicle. Grocery stores in Roatan are filled with an eclectic mix of products reflecting the eclectic mix of residents on the island. You’ll find ample imported goods alongside local staples. If you move here permanently, you will easily find local products to replace the obviously more expensive imported brands. There are large grocery stores in both Coxen Hole and French Harbour, with a multitude of mini-marts dotted throughout the rest of the island for basic needs. Roatan hospitals include the public hospital and the private Woods Clinic – both in Coxen Hole. A brand new hospital in French Harbour was completed in 2016 in cooperation with Hospital Cemesa, a very popular medical center on the mainland. You’ll also find several medical clinics around the island. In Sandy Bay, you’ll find the AKR clinic (aka Cornerstone at Anthony’s Key Resort), which also houses the island’s hyperbaric chamber. You’ll also find Clinica Esperanza (aka Nurse Peggy’s Clinic). At Parrot Tree Plantation east of French Harbour, you’ll find the GARM (Global Alliance for Regenerative Medicine) Clinic. There are also several pharmacies around Roatan, primarily in West End, Coxen Hole, and French Harbour. There is no shortage of expat families with children in Roatan. From children’s playgroups to athletic teams to community centers, there is plenty to keep kids busy and having fun in Roatan! The best part of raising your kids in Roatan is the variety of cultures they encounter on a daily basis. They’ll go to school with kids who speak different languages at home and they’ll learn about so many different parts of the world, all while exploring the natural playground around them. Individual homes’ utilities costs can vary dramatically. If you purchase a large home and run air conditioning all day and night, beware your electric bill. Electricity costs in Roatan are your highest expense at around $0.40/kW. Solar panels are an option for your home, although of course the initial cost of installing them must be taken into consideration. Water and gas are very affordable and TV/internet is as well. Most Roatan kitchens have gas stoves, so you’ll replace your propane tank as needed for around $20. Homes might have a private water supply or be on public water, so those costs can vary but never stray much higher than around $25/month. Roatan is a tourism paradise, so you will never tire of things to do when you move here! Of course, as a resident you likely won’t be participating in tourist activities on a daily basis. However, you can’t move to a tropical island and not avail yourself of the wonderful natural playground we have on our doorstep! Kayaking, paddleboarding, snorkeling, swimming, fishing, golfing, and scuba diving are all regular pastimes for residents. Day trips to other islands, a weekend on the mainland, or heading to nearby Guatemala, Belize, or Nicaragua are also very popular options. On a more regular basis, you’ll likely enjoy BBQs on the beach, sunset drinks at the local watering hole, and maybe karaoke night or live music a few nights each week. You can relax on a lounge chair in the sand or stretch out in a hammock to sway in the breeze. Even if you’re working, you’ll always find time to enjoy this beautiful tropical island paradise. There might not be any bowling alleys or cinemas in Roatan, but we have plenty of outdoor activities to keep us active, and the Caribbean Sea offers an ever-changing view to watch on the biggest screen ever created. I’m sure you’ll enjoy it as much as I do! 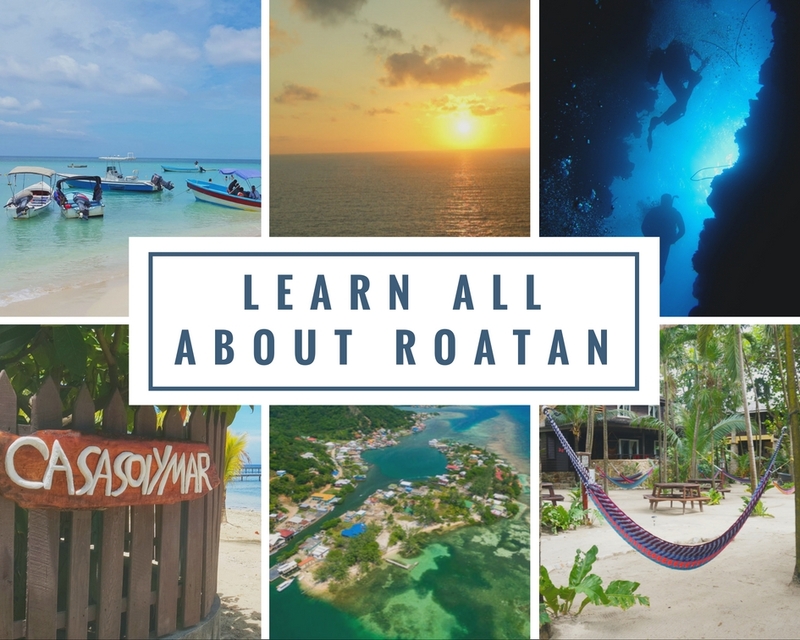 Want to learn more about life in Roatan? Connect with me on Facebook and Instagram to see regular photos and videos I post from my daily life on the island. This could be your life, too. Reach out and say hello – I’d be happy to chat about your Roatan dreams!